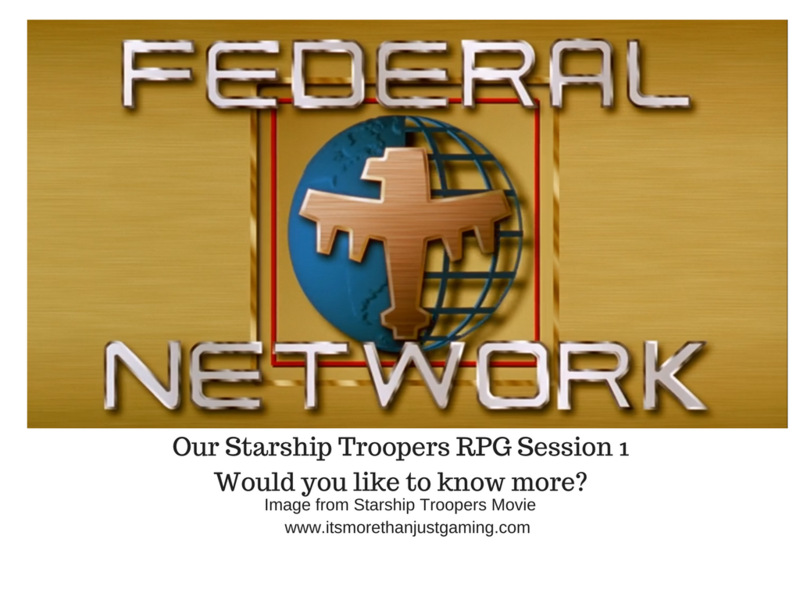 Our Starship Troopers RPG Session 1 – Would you like to know more? January 12, 2018 January 4, 2018 JohnGames / GamingNo Comment on Our Starship Troopers RPG Session 1 – Would you like to know more? We did our character creation and though we all had ideas about what sort of characters we wanted to play, we were informed the first adventure we would simply be Mobile Infantry. We said sure and made characters anyway. I created a Marauder Pilot, callsign “Jester”. I have no interesting backstory as for why he is called Jester, but I like it as a call sign. One of the characters in my fiction also has that name and his backstory is brilliant, if I do say so myself. Jester is also the call sign of Michael Ironside’s character in Top Gun. Michael Ironside also plays a pivotal role in the movie. And if you are unaware, a Marauder is the Starship Troopers equivalent of a Battlemech. They appear in Starship Troopers 3: Marauder. Sarah created a Psycher character called “Echo”, and though her Psi powers were undevelopped in the first game, I am assured that will not be the case in future games. Sarah’s husband Simon created a sniper, call sign “Deadeye”. Chris created a standard MI trooper which we assigned the Callsign “Coward” to. This is because he ran away from combat. It proved to be the right course of action as it turns out but we felt it deeply inappropriate that an MI operator’s first instinct was to run. And Alexander created a Neo Dog Handler called “Rope Boy”. This was due to his player having a social life and missing a session, but his character was still there. On a rope, as it were. If you are unfamiliar with the source material, Neo Dogs are genetically enhanced battle dog things that have an empathic/psychic link to their handler. Alexander didn’t start with his Neo Dog in game 1 but was assured it was no problem for later in the short campaign. I should also point out that Mobile Infantry in the Game are quite different from the lightly armoured and armed troops you see in the film. I saw a comment somewhere that the movie MI troopers were a good representation of an “Imperial Guard” Movie for Warhammer 40k. Possibly for the Cadian regiments. . Mobile Infantry wear suits of mass produced military power armour that would give Iron Man and War Machine a run for their money. A squad of MI Troopers in their power armour can overpower a column of tanks by themselves. They also have jump jets which allow limited leaping, leading to the phrase “On the bounce” and also the name “Mobile Infantry”. It is 3 years after the Klendathu Invasion. Fleet and MI have been waging a protracted war with the Bugs within the Arachnid Quarantine zone, and now a new theory has been floated. There is another caste of bug that has not been seen yet. A leader caste, possibly even higher up than the Brain Bug captured on Planet P after Klendathu. And the Brass believes there is at least one of these leaders on Planet Durabo. As such, a mobilisation of 5000 MI troops are mobilised for invasion. Their orders. Engage the Bugs in open full on warfare, hopefully drawing one of the leaders into the open for study and capture. We players were part of that Invasion! I would note I am in the process of reading Starship Troopers and whilst I love the Klendathu drop scene from the movie, MIs would be deployed in what are basically landing torpedo/drop pods. We landed on the planet, and the phase one of the plan worked. The Bugs came out to meet us. That was when it all went wrong. As it turns out, Planet Durabo had an oxygen rich atmosphere, more so than Earth. And as such, that meant special ammunition was required that didn’t cause all of our weapons to jam/explode in the first 30 seconds of combat. Unfortunately, the Quartermaster in charge of supplying this invasion didn’t account for this and as such we had the standard ammo, which heats up lots and is prone to explosion in Oxygen Rich Atmospheres. Consequently the massed fire of the Mobile Infantry against the mighty bug swarm became mechanical failures, explosions and mass running away of the Mobile Infantry. In the first minute of the Engagement, half the invasion force was lost. In the following minutes, most of the rest were slaughtered too. And that point is where the game started. We five were not together, but were running through jungle terrain pursued by Bug Drones. Fortunately the warriors and tanker bugs were having fun murdering our less fortunate comrades and cracking open my abandoned Marauder suit like an egg. By coincidence (for coincidence, read GM Fiat) we all arrived in a clearing at precisely the same time. “What Unit? Identify yourself!” I barked at the others. “Happened all along the line, every weapon, every unit. Wrong ammo,” said Deadeye. “Someone is going to die for this, if I have to make it happen myself,” Jester said. “Then lets get a move on,” I said. That was when Three Bug Drones lurched from the trees. Without waiting to see who obeyed, /i opened fire. Deadeye, Echo and Rope Boy took up positions and obeyed. Naturally, weapons jammed – but not all of them and we were able to hold the drones back and even kill a couple. Also, predictably, more Drones from the approaching swarm appeared at the edge of the clearing. There was nothing for it. Running was the only option available given the reinforcements in the trees, and the likelihood of more nearby. So, we fled. MI suits are fast and more agile in jungles as packed as this, more so than bugs which were larger and more cumbersome. So, we ran and were able to outpace the swarm. Then we received another transmission from the Marty Robbins, our rescue boat. They were going to hold position for 1 more hour and then they were bugging out as they were taking heavy fire from a Plasma Bug. Our squad had a confab. The retrieval point was bout 40 minutes at a dead run. Less if we risked jump jets but none of us fancied that. However, we also were able to see the Plasma Bug from our position, a Giant Bug that squirts plasma into space to knock out starships. It was about 10 minutes out of our way. We could sprint for the boat and hope that bug plasma wouldn’t kill our chances of rescue, or we could detour to the bug and try and take it out buying the boat more time. We were MI. We went after the bug. We found the Plasma Bug nestled in a crater, guarded by Drones and Warriors. We also knew that the carapace of a Plasma bug was pretty tough, and we really didn’t have the firepower to breach it. However, the plasma launcher was extremely vulnerable to fire. and it was firing every ten minutes. So we quickly agreed to set up a number of shots using our grenade launchers (underslung on our standard MI rifles) and waited for the next opportunity. We didn’t have to wait long. The large plasma battery was revealed as the carapace drew back and started to throb and glow, in preparation for firing. A click across our comms from Deadeye gave the order to fire. And fire we did. I didn’t, my weapon jammed. But the rest of the team did. Grenades flew into the vulnerable plasma weapon, and whilst they didn’t outright kill the bug, the secondary explosions caused by the oxygen rich atmosphere and leaking plasma not only seriously wounded the Plasma bug, but also devastated its guard of drones and warriors. We ran once again, mission accomplished. We barely made it to the retrieval point on time, the life boat circling the clearing designated for pickup when we arrived. We could hear a swarm of bugs close behind and the pilot radioed they needed to make another pass. We couldn’t run this time. We needed to hold until the boat landed. So we formed a line and waited. The retrieval boat opened fire devastating the entire bug frontline before coming in for a landing. And that was when we saw it. Standing among the survivors was something the likes of which we had not seen. It looked like a warrior by its markings and how it was put together, but it was bigger and had weird antennae on its thorax. I turned on my helmet cam to record the new bug, it was what we were here for anyway. The bug swarm didn’t attack, oddly. One of the antennae was broken off when our rescue boat strafed the area, and Deadeye decided to retrieve it as evidence. Then our rescue boat landed and retrieved us. The boat took us back to the Federation Corvette Marty Robbins, landing in the dorsal retrieval hangar. Unfortunately, the ship had taken quite a beating from plasma and the section connecting the landing hangar to the rest of the ship was destroyed. No problem for tough guy Mobile Infantry with our powered armour, except for Rope Boy who had developed a number of rips in his suit due to going hand to hand with a bug. There was nothing for it. The squad had to make the crossing relying on armour contained breathing gear, pulling the compromised squadmate, on a rope, with them. The journey was rapid, but not too difficult for hardened MIs and we were welcomed onboard ship, and escorted to the bridge to be debriefed by Captain Kurn. The damage level was obvious on the approach to the Robbins. It had taken a beating from Bug Plasma and was being held together with scorchmarks and elbow grease. The squad looked around initially dumbstruck. We six were the sole survivors of 5000. And then something clicked. “We just want to know what is going on, M’am,” I said. I didn’t safety the weapon, but I did lower it. “Who calls for retrieval at the start of a fight?” asked Echo. “Would that be someone who orchestrated this whole mess?” asked Deadeye. “I have said all that I can.” The captain’s flat statement was punctuated by the main bridge door opening and a man wearing a black officer’s uniform stepped into the corridor. Military Inteligence. “Thank you captain, I will take over the debriefing, dismissed.” The new officer was curt but not overtly disrespectful. The captain retreated to the sanctuary of her bridge. “You masterminded the invasion?” I said, my rifle slowly rising. The Last Jedi – What lessons can a Writer/Storyteller learn from this film?